Get the most value for your money with Top Rated Professional Grade Cooking Equipment!Cast-iron skillets may seem like an old-fashioned choice in the kitchen. But this dependable cookware is a must in the modern kitchen. Cast-iron skillets conduct heat beautifully, go from stovetop to oven with no problem and last for decades. The Utopia Kitchen pre seasoned cast iron skillet brings traditional and healthier cookware to your kitchen. Perfect for cooking, steaks, vegetables, and more. It can be used in the oven or over a strove or campfire. Pre seasoned, that lovely sheen on cast iron cookware is the sign of a well-seasoned cookware, which renders it virtually nonstick. The health bonus, of course, is that you won't need to use gads of oil to brown crispy potatoes or sear chicken when cooking in cast iron. How to re season skillet? To season your cast iron skillet, cover the bottom of the pan with a thick layer of kosher salt and a half inch of cooking oil, then heat until the oil starts to smoke. Carefully pour the salt and oil into a bowl, then use a ball of paper towels to rub the inside of the pan until it is smooth. 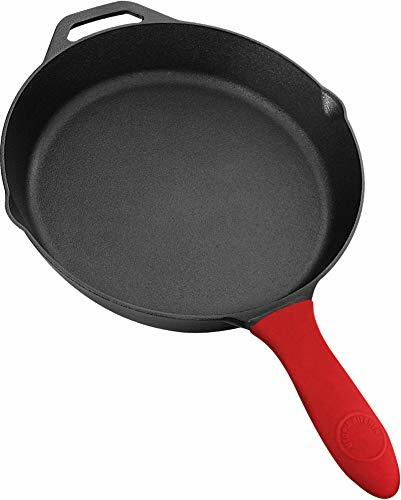 Benefit to using cast iron pans in place of nonstick pans is that you avoid the harmful chemicals that are found in nonstick pans. The repellent coating that keeps food from sticking to nonstick pots and pans contains PFCs (perfluorocarbons), a chemical that's linked to liver damage, cancer, developmental problems. All our cast iron cookware is LEAD FREE.